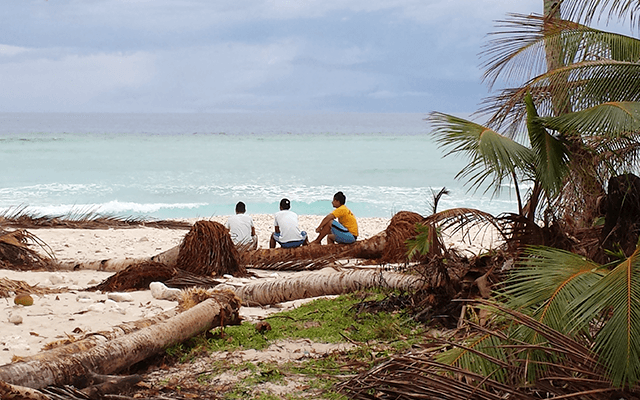 The climate change narrative has evolved from assessing predominantly the environmental impacts of disruptive weather patterns to evaluating their effect on human security. The risk of displacement increases exponentially when vulnerable populations, that lack the tools or resources to adapt to the changing environment or to migrate, are left to face the debilitating impact of climate change. This applies in particular to low income, developing countries where a vast majority of the population is not equipped with the basic instrumentalities of resilience required to safeguard their lives and livelihoods against unpredictable climate shocks and the State has limited resources to assist in enhancing this resilience. In line with the findings of previous research, this blog post suggests that legal responses to address the impact of climate change on human security should employ a hybrid approach. Such an approach aims to formulate a legal mechanism rooted in environmental law, human rights and refugee (migration) law that derives its strength of enforcement from the tripartite functionaries of all three legal faculties and can be implemented within an international legal context. The foundation for adopting such an approach lies in the concerted arguments for evolving legal articulation posited within both the policy oriented jurisprudence developed by Lasswell and McDougal and The Living Tree Doctrine of progressively interpreting accepted legal norms. This reasoning has been corroborated by the recent trend of international courts using an ‘adaptive interpretation’ of international law while delivering both judgments and advisory opinions. The Fifth Assessment Report of the Intergovernmental Panel on Climate Change (IPCC) as well as the growing diaspora of environmental migrants have resulted in the courts having to address petitions of asylum through progressively applying the canons of international law to regional contexts while responding to nuanced legal conundrums such as the displacement of populations due to climate change. This was reflected in the 2014 Siegeo Alesana v. New Zealand case, where a family claiming refugee status due to the rising sea levels around their home country, Tuvalu were granted on humanitarian grounds permanent residence to stay in New Zealand. The legal mechanism to address the causes of climate change can be found within environmental law. These include legal responses to the violation of environmental principles or accepted international norms. The effects of such violation in turn are, however, mostly sought to be redressed under human rights law regimes due to the impact faced at the household level; such as the violation of the right to a clean environment, the right to health, the right to work etc. Similarly, a subsidiary effect of climate change is the displacement of populations over time due to such impact; the remedy for which is found within refugee (migration) law. The response, in this regard, may be immediate, intermediate or long term. Over 30% of the communities impacted by climate change choose to migrate over employing an adaptive response simply because migration presents a more immediate and effective solution. 1. It presents a clear picture of exactly where the legal instruments to address each aspect of the loss and damage caused by climate change can be sourced from and simultaneously allows for the combined application of the principles encapsulated within all three branches of law to respond to such loss and damage. Moreover, the strength of the principles within each branch of law, whether soft or binding, can counterbalance each other in the formulation of legal arguments to address specific violations. For example, while the strict liability of the polluter may vary across jurisdictions, the human right to a clean and healthy environment is a fundamental and inalienable human right, which forms a part of customary international law. 2. The increase in the level of protection afforded to the victims of climate change exponentially increases due to the tripartite instrumentalities available at hand, thus resulting in a stronger approach to facilitate the preservation of human security. For example, the legal protection of climate refugees/migrants is found not within refugee/migration law but under human rights law and environmental law. Although the 1951 Convention in itself does not apply to climate migrants, the principles under it such as ‘non-refoulement’ can be extracted from it and made applicable to climate induced migrants. While hybrid law, as a research tool, was intended to be applied only to the Pacific Islands it has demonstrated since its elaboration in 2007, its applicability in a multitude of contexts across varied geographical regions affected by climate change, including South Asia, North Africa and the Arctic. The evolving nature of environmental issues faced by the majority of individuals requires that the law adapt to facilitate suitable responses and enable the long-term resilience of the most vulnerable populations to the changing environment. The law must be formulated as a precautionary measure to prevent the debilitating impact of climate change at a local level. However, most legal directions seem to be focused on regulating human mobility at international levels with little regard for the effects of such phenomena at the regional or local level. To address this and other limitations in the climate law articulation, the hybrid concept therefore could be extended from being just a research tool to enabling regulatory mechanisms as well. This would involve a collaborative effort towards deriving a hybrid mechanism, through a multilateral alliance of the environmental bodies such as regional UN agencies, human rights bodies and the United Nations High Commissioner for Refugees, (UNHCR) under the aegis of the Secretary-General. This would, in effect, represent a sustainable and efficient solution that would perhaps enable a concerted and focused endeavor towards addressing the impact of climate change at the household level. The hybrid approach could thus be instrumental in developing innovative legal solutions to address the issues highlighted within the Paris Agreement such as facilitating the growth of climate change legislation to address loss and damage at a local level, enabling the progressive involvement of non-state actors and focusing on the continuous engagement of climate change with human rights, especially with regards to the rights of indigenous people, local communities and migrants. As argued during Climate Law and Governance Day alongside COP 22 in Marrakesh, a bottom-up human rights based approach facilitated through this hybrid legal articulation could therefore mark the beginning a new era of climate governance; one that addresses climate change from a multi stakeholder perspective at a fundamentally grassroots level and then works its way upwards to the national, regional and international sphere. This article was originally published on the Climate Law and Governance Initiative blog. Read the original version here.